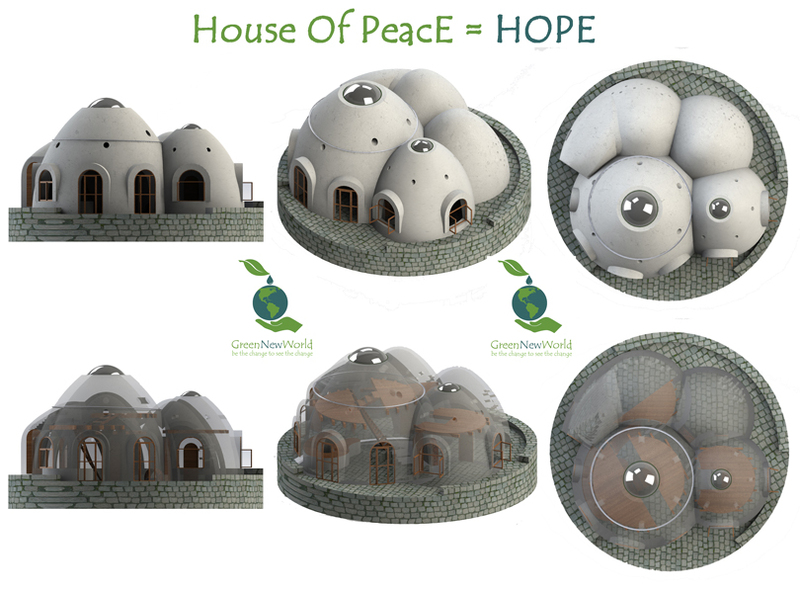 The House of PeacE or Project HOPE aspires to develop housing models that address crucial challenges of the 21st century by designing regenerative and self-sustaining shelters that provide for the essential needs of its residents. The objective of Project HOPE is to develop decentralized autonomous housing models that integrate water, energy, waste and food production into a whole system design that can be adapted to different climate zones by integrating modular components. Modules are selected based on a low embodied energy and environmental footprint while being simple to recreate with basic skills and as far as is possible are constructed with locally available low cost and low impact materials. The first HOPE model HOPEone is nearing completion where the productivity of the core bioenergy modules and carbon sequestration modules will be assessed for the development of future prototypes. HOPEone will generate energy from renewable resources, collect water from rain, process biowaste and convert it to biogas and organic fertilizer while sequestering carbon dioxide and providing a safe and healthy habitat. 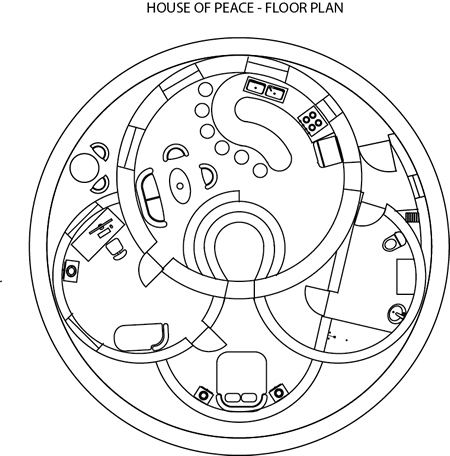 The original name of the House Of PeacE, or "HOPE," was unintentionally derived from the building layout of the first model HOPEone, which was four domes in a cluster shaped like a peace symbol. For HOPEone we have chosen a method of sustainable earth architecture pioneered by Gernot Minke and Nader Khalili known as Earthbags or Superadobe. A mix of clay, sand and gravel is used to create strong, ecological and affordable structures. Domes built out of Superadobe withstand earthquakes, fires and storms alongside being ecologically sound. The double curvature of a dome utilizes 19 % less walls and less air space in comparison to cubical structures with the same footprint. Another feature unique to domes is the natural and efficient flow of air to regulate their interior climate. The building technique is simple and can be easily learned by unskilled people and built with family, friends, or a community. 95% of the building is made out of earth! Earthen structures like many other natural building materials breathe, which is beneficial to the wellbeing and health of its inhabitants. HOPEone is designed to wick moisture and to equilibrate with the average seasonal air humidity. For this purpose, a special natural-based weather proofing plaster was developed that withstands torrential rains and allows for the passage of vapor. For more information visit our Natural Building page. Most homes consume a large percentage of energy for thermal regulation. The combination of passive thermal elements in many scenarios can eliminate the need for energy dependent active heating or cooling systems. The elements that have been selected for thermal regulation modules include thermal insulation, thermal mass, solar thermal, solar vents, evaporative cooling, wind cooling and geothermal. HOPEone is being built in a subtropical location with cool nights and warm days. Thermal mass is ideal in such a climate where solar radiation can be stored in the walls throughout the day and given off at night. This creates a natural cycle of keeping the structure warm at night and cool in the day by adjusting the thickness of the walls to produce a 12-hour thermal lag. The geometry of domes facilitates energy efficient thermal regulation. Cooling occurs on warm days when hot air is driven by convection to the apex and extracted by vents as a result drawing fresh air from the air-ground heat exchanger that brings cooled air to the living space. The warmer the air is, the stronger the convective forces are, resulting in a higher cooling efficiency. This passive cooling system can be further enhanced for hotter climates by coupling it to a solar vent, an evaporative cooler or wind catcher depending on the local climate. On cold days the ground-heat-exchanger has a loop for active heating with a multifunctional biomass gasifying unit that is able to conserve 50% or more of the carbon. One of the core objectives of Project HOPE is to demonstrate autonomous and sustainable water harvesting systems with emphasis on rain and air-moisture catchment (HOPEtwo). The abundance of water at the HOPEone location only necessitates a simple rain catchment system as there is an artesian spring on site. The system design and sizing for rain catchment depends on the distribution and amount of rainfall as well as the consumption of inhabitants. With a catchment area of 50m2 and an average rainfall of 1000mm per year this system can potentially collect 50m3 per year, twice as much as needed. The collection tanks are treated with ozone and pass through a 3 stage purification, mineralization and alkalization treatment system. 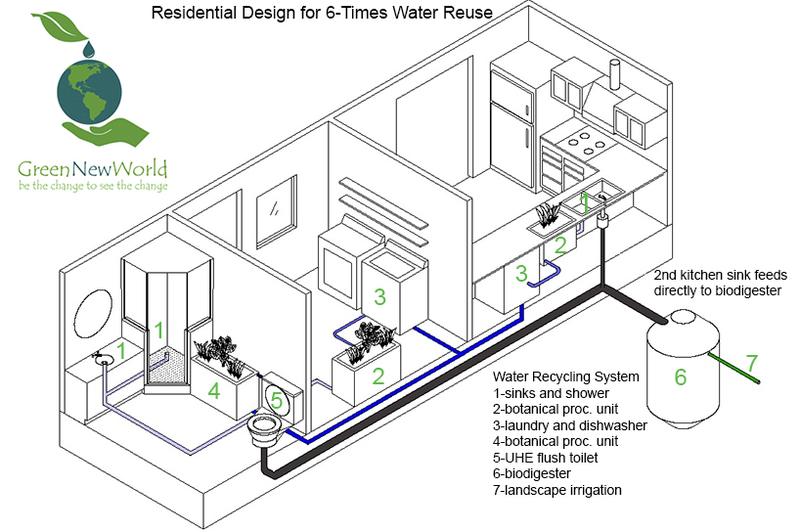 HOPEone integrates a water recycling modules that uses every drop of water 4-times reducing water consumption by 75%! Water from taps and showers are filtered through a greywater processing unit while watering indoor plants and then reused to flush an Ultra High Efficiency (UHE) flush toilet that converges with other biowastes into an anaerobic bioreactor. After digestion and filtration it provides safe landscape irrigation through a leachfield. In addition, water-saving shower heads and faucets are installed to further reduce consumption. Based on initial calculations daily water consumption is expected to be less than 20 liters per person. In a future prototype a 6-fold water recycling system will be tested in addition to a closed loop water reclamation system for radical conservation that can further reduce daily consumption to 5-10 liters per person. For more information please visit the water conservation page click here. Special consideration is given to water treatment. Holistic water treatment is distinct from conventional water treatment systems as only biophilic (life supporting) and ecological processes are selected. For example, ozone is used instead of chlorine for disinfection. The source of water and it’s contaminants determine the configuration of the water treatment modules which consists of up to 5 modules that filter, purify, disinfect, mineralize and balance the alkalinity. Please visit our Holistic Water Purification page for more information. The design of hybrid energy systems is based on simple modular diversification to optimally match local renewable resources to the needs of a residence. As much energy as possible is generated thru thermal or biofuel modules to minimize the needs for resource intensive electrical systems. By integrating energy saving technologies such as LED lighting and energy efficient appliances, daily consumption in HOPEone is estimated to be much less than 1 kWh per person! With an average daily insolation of 5 kWh/m2 at the first location a four person household will require only 1 kW of PV panels generating 120% of the electricity! In addition, a small 100 Watt experimental solid state thermoelectric generator (TEG) that extracts waste heat will be tested. This is particularly useful to reduce the need for storage when PV is used in the daytime and waste heat TEG is used at night time. When loads at times draw more than 10 A such as with power tools the 3 kW peak demand biogas generator supplies the power. Therefore only a small lithium battery bank rated at 12 V 500 Ah is adequate. Average demand is met by PV and TEG modules while peak demand and backup power is delivered by batteries and a biogas generator. A substantial benefit to cost, efficiency and resilience of renewable energy generation by diversifying in peak and average power generation is gained. For more information please visit our page. Algae can produce biomass without using arable land to produce biofuels, bioplastics, food and to capture carbon dioxide. The focus of HOPEone is to develop residential rooftop photo bioreactor modules that produce a carbon negative biofuel. In HOPEone the green microalgae c. vulgaris is grown in a photo bioreactor that receives nutrients from the liquid effluent of the anaerobic bioreactor and CO2 from the emissions of the biogas heater, biogas generator and biomass gasifier. In return, c. vulgaris is fed to the anaerobic bioreactor to balance the carbon content and provide additional biomass for increased biogas production. For every kilogram of c. vulgaris grown, 0.9 kilograms of CO2 are removed while generating 15,000 BTU/hr or 3.4 kWh of energy. If enough biogas is already being generated the algae can also be dehydrated and stored or used for biomass gasification. We see much future potential in residential photo bioreactors as they can also aid in thermal regulation of the buildings by shading or thermal mass which will be explored in future HOPE prototypes. For more info on biofuels please click here. There is much merit in developing residential biomass gasification systems as it is an established and efficient way to generate energy with biomass while sequestering carbon dioxide. The multifunctional use of biomass gasification will be tested that can optimally provide for additional cooking, residential hot water, laundry drier and a dehydrator while heating the house. The end product of biomass gasification retains around 50% of the carbon as biochar to be used for many applications including filters, building materials, medicine or as a valuable soil amendment. When biomass gasification is coupled with an algae CO2 scrubber, even more than 75% of the carbon can be sequestered as it is cycled in a closed loop thru different modules until it is extracted as sludge and gasified again. HOPEone will provide us insight into these integrative systems. Theoretically it is possible to sequester most of the carbon that enters the biowaste system. Primary water heating is sourced by thermal solar and secondary water heating is provided by an on-demand 95% efficient biogas/natural gas heater and an additional heat-exchanger in the biomass gasifier serves as a backup. Cooking is primarily performed with a natural gas stove using biogas and with a backup propane tank that will be used with a specially developed regulator to simulate natural gas so that no modifications to the appliances are required. Residential biowaste processing takes a central stage in Project HOPE. Biowaste has a great potential to generate carbon neutral or even carbon negative biofuels. Only with the development of other supporting modules does anaerobic digestion technology become efficient enough to be a viable solution for onsite residential biowaste processing. The water recycling module in conjunction with an UHE toilet increases the wastewater solids content to more than 10% which would be impossible to obtain in a conventional residential wastewater system. The solar thermal water module serves as a heat-exchanger for the anaerobic bioreactor to maintain a stable mesophilic temperature for optimal biogas generation. Three products are generated in the anaerobic bioreactor that are separated by gas, liquid and solid effluent outlets. The biogas from the gas outlet is purified and used for cooking, residential hot water and to power a peak-demand backup generator. The liquid effluent provides consistent and safe irrigation to orchards through subterranean leachfields. The solid effluent known as sludge is used as an energy dense carbon negative fuel to make biochar with the biomass gasifier module. If fertilizer needs are greater than energy needs sludge can also be composted to produce organic fertilizer. 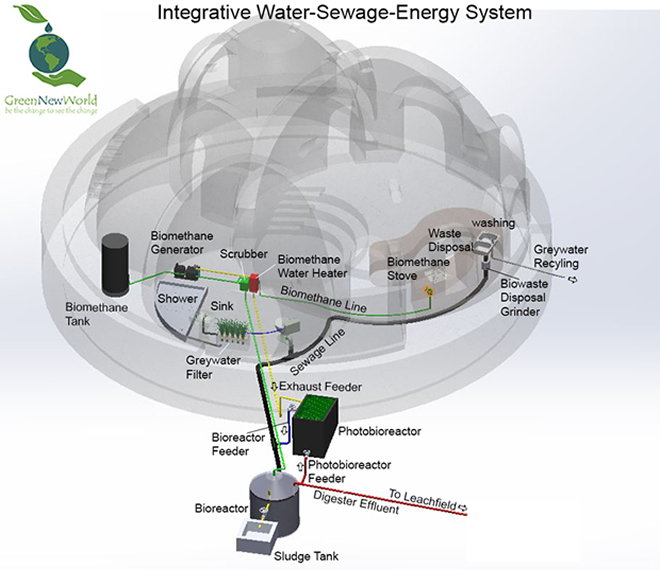 Integration of an anaerobic digestion reactor into a residential household sewage system provides tremendous benefits of eliminating centralized systems, being environmentally beneficial, providing renewable energy, providing organic fertilizer while being cost effective and aiding in the sequestration process of carbon. For more information please click here. One of the least efficiently utilized resources worldwide is biowaste. According to studies, human urine can provide 50% of the global fertilizer needs. In conjunction, with other kitchen wastes and septic wastes all the organic fertilizer needs can be generated! Where urine diversion UHE toilets are employed, the urine is used to charge the biochar which is a nutrient-rich carbon-negative soil amendment and fertilizer. Furthermore, the pasteurized effluent from the bioreactor is also a safe source of organic fertilizer. In addition, the sludge from the bioreactor if not used for gasification can be composted to produce a rich organic fertilizer. In urban scenarios where fertilizer is not required, all biowaste can be used for biomass gasification which provides additional thermal energy and biochar while fixing carbon. Furthermore, the biochar can be stored as a backup fuel for the gasifier. It should be kept in mind though that this process is then considered only carbon neutral.